Travelling to Udaipur for a holiday? Don’t know which areas are best for a stay in the city? In this post, I will be sharing my top Udaipur Budget Stay options along with some really good Palace and Heritage Property Hotels. Udaipur is one city where you can choose from a vast range of stay options. Homestays, hotels, hostels, heritage hotels, palaces, the city has it all. Udaipur as a city is slightly on the expensive side. So if you are travelling during the peak holiday season, you might have to pay more than usual. That said, you can easily get a decent room with a view of Lake Pichola for a starting price of INR 650. The usual four to five-star hotels charge somewhere between INR 2500 to upwards INR 5000 depending upon how fancy the hotel is. Honestly, I would recommend just finding a good Udaipur stay option in the Lake Pichola area. Most of the budget stays are available easily in the price range of INR 600 to INR 3500 in this part of the city. 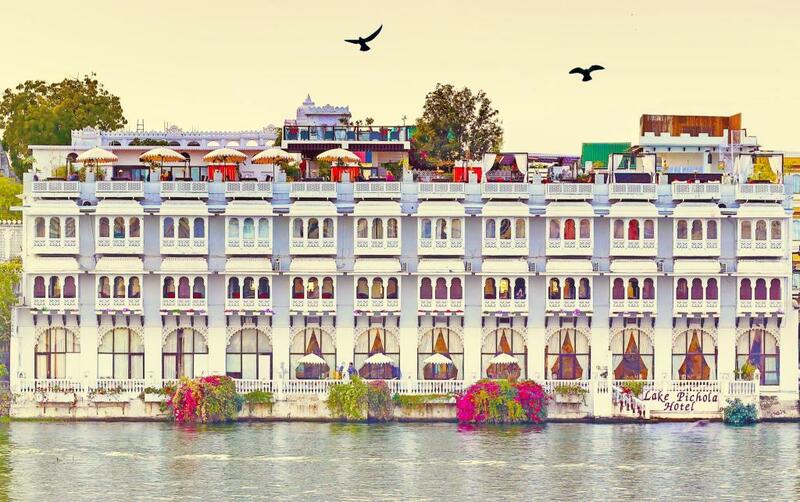 Lake Pichola stands in the old part of Udaipur and boasts some of the most iconic views of the city. If you move a little further, then finding a place around Fateh Sagar Lake is also a good option. Fateh Sagar Lake stands at a short distance of 20-30 min drive from the old city of Udaipur. The only good thing about this area is the accessibility of local transport to your hotel. Kindly note that for budget stays inside the old city of Udaipur, you might have to drag your bags on your own to your room. The old city has narrow lanes which only allow two-wheelers to move freely. Even rickshaws don’t usually agree to come inside the city due to heavy traffic. How To Choose The Best Udaipur Budget Stay For Your Holiday? From my various Rajasthan travels, I have figured out an easy way of narrowing down my stay option in any city. For Udaipur, open Google Maps and check the distance between City Palace Udaipur and your preferred hotel/hostel stay address. You should pick a location which is walking distance from City Palace. Most of the sightseeing locations are present within walking distance of the palace saving you a lot of time, energy and travel money. If you stay within the Lake Pichola area, here is the list of sightseeing places you can cover by foot. I have recently gone cray-cray about Airbnb stays. They are super duper affordable and are located in the most enviable areas in any tourist city. The Udaipur Airbnb we chose for our stay in December cost us INR 650 a night. The Airbnb was called Udai Haveli. It was a hostel stay. But we had booked a private room. It came with a double bed, hot water, and yummy breakfast which cost bare minimal. Not recommended for family stay, but if you are travelling with friends, it is total paisa-vasool. In this post, however, I am sharing some mid-budget awesome Udaipur Budget Stay options. The price range would be from INR 2500 – INR 4000. Please note that all of these Udaipur Budget Stay recommendations include private rooms with basic amenities like air conditioning, a double bed and a wifi. Since the beginning, I used to prefer GoIbibo over all other hotel booking sites. But of late, what I’ve noticed is that GoIbibo gives out hotel prices before taxes. The minute you reach the payment page, you end up seeing a 30% increase in your booking amount which is such a mood kill. So, the other alternative is to look at comparison websites like Booking.com They give out prices of hotels from different websites giving you a good sense of which website is offering the best deal. While researching for Udaipur hotels, I also came across Agoda.com which was quite helpful. The only trick of getting the best price is to do a thorough search on the internet for the best prices. If you can, call the hotel reservations and check if they are providing a better deal. Take for instance, in case of Chunda Palace, I figured getting a 3rd person bed in the same room costs INR 1500 extra if booked by the hotel directly as compared to INR 2000 on online websites. It doesn’t hurt to ring up the hotel just in case. If you are travelling with your family and kids, this is a great budget-friendly option in the heart of Old Udaipur. The location is what makes it worth the money. The room comes with a double king size bed which is ideal if you have a 3-4 member group. It also has a lovely colourful rooftop restaurant. Plus, as you can see from the pictures, that’s the million dollar view of Lake Pichola. A single room at this hostel costs INR 2499 a night. The Kankarwa Fort northeast of Udaipur still stands testimony to the family’s rich history. Early in the 19th century, the Maharana gave the Thakur of Kankarwa permission to build an urban house in Udaipur City. Construction began around 1820 and is presently known as Kankarwa Haveli. In 1993 the family began renovation work and within two years Kankarwa Haveli opened its doors for travellers while remaining the city dwelling of the original family. if you are looking for a heritage old property on a budget, there is no better place to choose than Kankarwa Haveli. INR 4,200 is a bit on the pricier side, however, I would urge you to look through the property pictures. If you are an Instagram and photo (crazy) person like me, this place is a no-brainer to shortlist. This heritage property is located at a short distance of 1.2 km from the City Palace. This is a heritage-themed boutique homestay. The only downside of this property is that it is located at a distance of 2.6kms from the City Palace Udaipur. I just fell in love when I saw the pictures of this property. There is a charm in the clutter that draws you to take notice of this homestay. Fresh, cute, non-fussy, this is a good option if you are a newly married couple travelling on a budget. The location is in the city centre of Udaipur and basically, you get what you pay for. A clean, Instagram friendly room centrally located. If homestays and hostels are not to your liking, this is a good alternative to go for. The hotel is located on the other side of Lake Pichola towards Ambrai Ghat but is a good option to try out in Udaipur Budget Stay. The best part – the hotel has an elevator, which means you don’t need to drag your bags up to your room on your own. I also found a link to the same The Little Prince Heritage hotel for a price of INR 999 a night. The distance from City Palace to this hotel is 1.6kms. Prices of all these homestays in Udaipur, hotels and other hostels fluctuate significantly depending on the month of your travel. If you are travelling in the peak seasons, then I would recommend planning your Udaipur Budget Stay as soon as possible as most of the affordable places run out pretty quickly. The offseason months of summers and monsoons are relatively quieter in terms of tourists and hotel occupancy. Rajasthan is usually hot throughout the year, so best if you plan during the early winter months instead of peak seasons. The Frugal2Fab Wedding Blogger in me just couldn’t help but share one destination wedding palace in this list. While most of the time this palace is actually quite expensive at over INR 10,000 a night. However, for the month of August, I checked the prices, and it seemed pretty reasonable for a Palace stay. My cousin from the US is travelling with two of his friends in the month of August. I had to find them a place in Udaipur. That’s when I thought of researching on Udaipur palace properties on a budget. What I noticed is that booking via the hotel’s official website was turning out to be much cheaper than online portals like Goibibo, MMT, Cleartrip and the likes. Strange, but we could book a Palace room for 3 at INR 8850 a night, as compared to INR 12-14k as shown in online portals. So if you are planning on shelling big bucks on your holiday stay in Udaipur, I suggest you to try looking at the official website page before making any decision. Located just 1.6km away from the City Palace, this gorgeous property is a vacation spot in itself. They have in-house folk entertainment and the reviews of this place have been great. If you are looking for an affordable yet luxurious stay experience, I highly recommend going for this one. Have you got any recommendations for Udaipur Budget Stay?